Cook Islands Māori is simply called Māori when there is no need to disambiguate it from New Zealand Māori, but it is also known as Māori Kūki 'Āirani (or Maori Kuki Airani), or, controversially, Rarotongan. 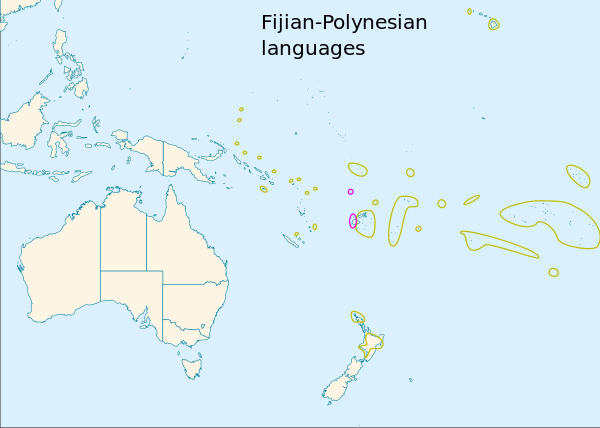 Many Cook Islanders also call it Te reo Ipukarea, literally "the language of the Ancestral Homeland". Mitiaro and Mauke) Aitutaki ; Rarotongan Mangaia. Kia Mildly imperative or exhortatory, expressing a desire, a wish rather than a strong command. Kia vave mai! 'be quick ! (don't be long!)' Kia viviki mai! 'be quick (don't dawdle!)' Kia manuia! 'good luck!' Kia rave ana koe i tēnā 'anga'anga : would you do that job; Kia tae mai ki te anga'anga ā te pōpongi Mōnitē : come to work on Monday morning; Teia te tātāpaka, kia kai koe : Here's the breadfruit pudding, eat up. Glottolog 3.0. Jena, Germany: Max Planck Institute for the Science of Human History. ^ Since 1915, English had been the only official language of the Cook Islands ^ in the sense of having mutual intelligibility ^ Tongarevan is sometimes also considered as a distinct language. Atiu nui Maruarua : E au tua ta'ito, Vainerere Tangatapoto et al. University of South Pacific, Suva 1984. (in Maori and English) Learning Rarotonga Maori, by Maki'uti Tongia, Ministry of Cultural Development, Rarotonga 1999. Te uri Reo Maori (translating in Maori), by Maki'uti Tongia, Punanga o te reo. 1996. Atiu, e enua e tona iti tangata, te au tata tuatua Ngatupuna Kautai...(et al. ), Suva, University of the South Pacific.1993. (Maori translation of Atiu : an island Community) A vocabulary of the Mangaian language by Christian, F. W. 1924. Bernice P. Bishop Bulletin 2. Honolulu, Bernice P. Bishop Museum. E au tuatua ta'ito no Manihiki, Kauraka Kauraka, IPS, USP, Suva. 1987. Cook Islands Maori are included in the open access [Arthur Capell] collection (AC1) held by Paradisec.